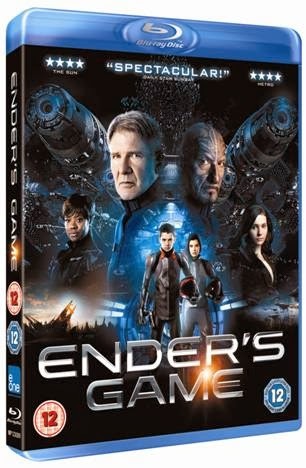 The spectacular and thrilling sci-fi epic adventure ENDER’S GAME featuring an all-star cast, explosive set pieces and breathtaking visual effects lands on Blu-ray and DVD on 10 March 2014 courtesy Entertainment One. Written and directed by BAFTA® nominee Gavin Hood (X Men The Origins: Wolverine), ENDER’S GAME stars a powerful blockbuster cast including Academy Award® nominee Harrison Ford (Witness, Star Wars, Indiana Jones) as determined Colonel Graff; Academy Award® winner Ben Kingsley (Hugo, Shutter Island, The Dictator) as heroic Mazer Rackham; Asa Butterfield (Hugo) as the strategically brilliant Ender Wiggin; Academy Award® nominee Hailee Steinfeld (True Grit) as talented Petra Arkanian; Abigail Breslin (Little Miss Sunshine, Zombieland) as compassionate Valentine Wiggin and Academy Award® nominee Viola Davis (The Help, Doubt) as second in command Major Gwen Anderson. Set in the near future, a hostile alien race called the Formics has attacked Earth. If not for the legendary heroics of International Fleet Commander Mazer Rackham (Kingsley), all would have been lost. In preparation for the next attack, the highly esteemed Colonel Hyrum Graff (Ford) and the International Military are training only the best young minds to find the future Mazer. Ender Wiggin (Butterfield) is recruited to join the elite. Arriving at Battle School, Ender quickly and easily masters increasingly difficult challenges and simulations, distinguishing himself and winning respect amongst his peers. Ender is soon ordained by Graff as the military’s next great hope, resulting in his promotion to Command School. Once there, he’s trained by Mazer Rackham himself to lead his fellow soldiers into a battle that will determine the future of Earth and save the human race. The future must be won as this epic adventure comes to Blu-ray and DVD on 10 March 2014.